4 Ways to Celebrate St. Patty’s Day in #DTJax! 4 Ways to Celebrate St Patty’s Day in #DTJax! St. Patrick’s day is right around the corner and we’ve prepared a list of the events/activities that you can only find Downtown! So wear your green and celebrate the luck of the Irish the right way this year in #DTJax! Everyone is Irish at Yappy Hour! Yappy hour is back at the Jacksonville Landing! Enjoy this free, dog-friendly event featuring festive drinks and treats, raffles, pet vendors, giveaways and activities to keep you and the pup busy! Do you think your pup has what it takes to become the “King or Queen of Green”? Dress up your pooch in their best GREEN attire and enter in the contest to take home the title! Plus, sign up for the beer drinking contest (dog and owners); pups will drink Bowser Beer and parents will drink green beer! 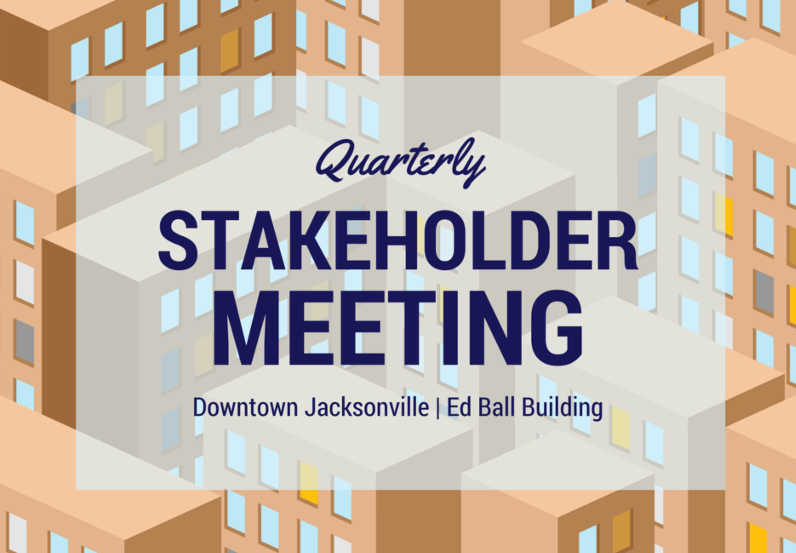 For vendor information, please email info to @jacksonvillelanding.com. Don’t Worry. Be Yappy. Details. Join our friends at Hemming Park for the 2nd annual St. Patrick’s Day Food Truck Takeover! There will be delicious food, cold beer, traditional music and much more! This year they are introducing a “Waggin’ Wagon Parade” with cash prizes for best-dressed pet and best-decorated bike or wagon! Enjoy some of your favorite food trucks like the Cuban Fire Grill, Happy Grilled Cheese, Treemendous Sea and Soul, Viva La Familia, Treemendous BBQ, Saffron Mediterranean, El Mariachi Loko, Waffle Stop Express and Island Dream! Get ready for another year of Food Truck Takeovers! Details. Get ready for THE PARTY of the Year at Fionn’s! Right on the St. Johns River inside the Jacksonville Landing, Fionn’s MacCools will be hosting a free event featuring live music, Irish food specials, drink specials, giveaways, Irish dance performances and more! They will also be serving Irish breakfast from 8 -11 a.m., followed by an Irish buffet 11 a.m. to close. Enjoy special performances by Danny Boy, Legacy IRISH DANCE Academy, Jimmy O’Solari, Rathkeltair, DjSeven Brown all throughout the day! PLUS, Pipes and Drums (Jacksonville Fire and Rescue Dept) will also be planning to celebrate! This celebration also includes a photo booth to capture your St. Paddy’s Day memories and face painting for the kids (and adults who want to be kids again), making it a perfect party spot to celebrate the day in Downtown! Doors open at 11 a.m.
Mark your calendars now because you won’t want to miss this! Details. Head to Myth Nightclub and enjoy music, dancers, arts, décor, culture and more this St. Patrick’s Day Weekend! This showcase features the regions best house and techno music on the Myth Terrace hosted by Myth’s very own Mike Shea. Doors open at 9 p.m. but be sure to head to Element Bistro for drinks and dinner starting at 4 p.m.
VIP, Express Entry and Discounted Tickets Available here! These are just a few ways to celebrate your St. Patrick’s Day weekend in #DTJax! For more details check out our Events Calendar for everything going on Downtown as well as our Directory to learn more about all the restaurants, shops and nightlife spots to enjoy. Be sure to visit parkdtjax.com for any of your parking concerns! With the 2019 #DTJax Gala: Havana Nights, Neon Lights! right around the corner, you might be wondering “why Havana, Cuba? What does that have to do with Jacksonville?” Well, here’s your answer, because #DTJax and Cuba go way back! Cuban immigrants were rolling authentic Cuban cigars in Florida since the early 1830s. In 1867, the first Cuban cigar factory opened in Key West, but it wasn’t long after that cigar manufacturers began importing Havana tobacco to Jacksonville to process locally and distribute via the Jacksonville Union Terminal, which was the largest in the South upon its completion in 1919. In 1895 however, Jacksonville was playing host to 15 separate cigar factories and thousands of Cuban immigrants working to make millions of hand-rolled Cuban cigars annually. Most of these factories were located right on Bay Street, which originally ran directly parallel to the north bank of the St. Johns, in order to be as close to the shipping docks as possible. [I]n 1924, Mayor John Alsop noticed a chauffeured Cadillac with an Ohio license plate traveling through town. Seizing the opportunity, he jumped on the car’s running board, introduced himself to the car’s occupant and convinced him to stay overnight in town. The occupant was cigar maker John Swisher. Swisher was the first cigar manufacturer to install cigar making machinery. Alsop, not only successfully convinced Swisher to bring his machinery to Jax, Swisher also decided to consolidate his 22 Ohio-based cigar factories into one large factory in Jacksonville. The building selected for his operation was a former World War I munitions factory in the New Springfield neighborhood. The large relocation also convinced a major Swisher supplier, the A.S. Ginter Box Company, to move to Jacksonville as well. Ginter’s new factory opened in 1924 across the street from Swisher’s. Swisher was able to weather the Great Depression better than the many smaller factories in Jacksonville and was even partially responsible for the closing of many Tampa cigar factories, which couldn’t compete with the sheer volume of product the company released into the market. Though the company recently made the decision to relocate the manufacturing process to the Dominican Republic, Swisher’s headquarters and distribution center will be staying in Jacksonville, a current link to our storied cigar past. Born and raised in Jacksonville, Napoleon Bonaparte Broward worked on the St. Johns and up and down the coast of New England before being appointed to Sheriff of Jacksonville in 1888 following the disgrace of the former Sheriff for a massive prison break. In 1894, he lost his appointment to a political rival and teamed with his brother and a mutual associate to build a steamboat, which they named the Three Friends. When open revolt against Spain occurred in Cuba, Jacksonville Cubans asked Broward if he would be willing to become a filibuster and smuggle munitions and individuals down to Cuba to aid in the revolt. He agreed, and made the run several more times, being chased by the U.S. Coast Guard who were tasked with stopping private citizens from disrupting the neutrality officials were trying to maintain, and the Spanish Armada, ordered by Alfonso XIII, King of Spain to sink the Three Friends on sight. In 1897, the Three Friends was seized by the United States government for carrying illegal cargo. Broward tried his best to argue an appeal, but the Supreme Court found that, while they could not prove who was responsible for the use of the Three Friends, as the circumstantial evidence of his ownership wasn’t enough to charge him or his associates directly, there was enough evidence to prove that it was used for smuggling, and the vessel and everything on it at the time of seizure was liquidated by the federal government. After declaring war on Spain, the United States began a massive recruitment effort to invade Cuba and remove Spain from their own province. The U.S. was increasingly supportive of anti-colonial Monroe Doctrine, and the public and press were up in arms over the apparent naval mine attack by Spain on the U.S.S. Maine (ACR-1), moored in Havana Harbor. The U.S. Army was hoping to triple its forces from 25,000 to 75,000, but ended up with a surging influx of soldiers, in all totaling 220,000, about half of whom enlisted the day after the Maine was sunk. Subsequently, engineers have reported that it was most likely a coal fire that caused the explosive sinking and deaths of 250 U.S. Navy sailors onboard the U.S.S. Maine, but the snap judgments of civilians coupled with the issue of yellow journalism stoked the emotions of Americans calling for war against Spain. Due to the massive influx of recruits serving in aid to Cuban efforts to overthrow their 400-year colonial rulers, the Army ran out of room for its forces in Tampa. It was decided to establish a secondary forward operating base just north of Downtown Jacksonville. Originally called “Camp Springfield,” the U.S. Army claimed 28 square blocks between Main and Ionia, 8th and 1st Streets. The base was renamed “Camp Cuba Libre” in response to the rallying cry of Americans who supported the Cuban liberation effort. Spanish for “Free Cuba!” Camp Cuba Libre was only operational for about three months, the entirety of the Spanish-American War. In August of 1898, Spain sued the United States for peace after sustaining dreadful defeats in both the Pacific and Caribbean theaters of operation. After two months of negotiations during a cessation of hostilities by both countries, both countries signed the Treaty of Paris, with Spain ceding control of the Philippines, Guam, and Puerto Rico to the U.S., as well as granting Cuba independence, though they immediately became a political protectorate of the United States. The tens of thousands of soldiers left packed up the camp and filled trains at Jacksonville Union Terminal, heading back to their hometowns, or down to Cuba to stabilize the region. The last soldier left Cuba Libre in January of 1899. Cubano culture is still vibrant and present in Downtown today. On Wednesday, March 6th, 2019, The Justice Pub will be hosting the Cien Calaveras [100 Skulls] Cuban Art Show & Fundraiser, an imperative by the Amigo Tattoo Charity to raise funds for Cuban artists who face difficulties getting supplies due to economic challenges. 100 skull shapes were cut out of old skateboards from Amigo Skate and sent to participating artists around the United States to be turned into calavera art and sold at Justice Pub to benefit the charity fund. So go check out Cien Calaveras while you’re at First Wednesday Art Walk March 6th and support a great cause! Registration: Runners can register to participate in the one-mile fun run for $25 and the MOO-VE IT 5K for $35 here. Cowford Chophouse is proud to announce that its third annual MOO-VE IT 5K will be held downtown on March 2 in remembrance of the late Michael Liles, former executive director of the Justice Coalition. The race will benefit the Justice Coalition, a non-profit organization that advocates on behalf of innocent victims of crime in the five-county area of Northeast Florida. The course will start and finish in front of Cowford Chophouse. Participants will run by the Jacksonville Landing and then out and back along the Northbank Riverwalk. There will also be a post-race block party on Bay and Ocean Streets, which will include music, beer and food for race participants. Medals will be given to all participants and top finishers will be recognized at an award ceremony. Each participant will receive a race bag with specialty items from event sponsors. Additionally, race sponsor Winston Family YMCA has partnered with Cowford to conduct both a “Couch to 5K” and “Couch to 15K” training program for 30 individuals total with 15 in each program. Individuals can sign-up to take part in this six-week training program, including three group running opportunities per week at the Winston Y, as well as additional fitness education sessions. Participants can register by emailing Ryan Parker, Winston Y Healthy Living Director, at rparker@fcymca.org. Space is limited, so sign up now! These local organizations are coming together to raise awareness and funds for the resources that support those who’ve been impacted by violent crime – and encourage the community to get involved! work as the Northeast Florida direct service provider for the Open Doors Outreach Network. Open Doors is a public-private partnership administered by Voices for Florida, which improves care, coordination and outcomes for commercially sexually exploited and trafficked children and young adults up to age 24. All the funds raised assisted the organization in receiving a grant match for this program! The New Year brings the promise of a new beginning and new opportunities. I think we are all guilty of making resolutions that are a bit too optimistic and end up not following through; recycling our list for the following year. However, 2019 will be different! One resolution you can make and keep this year is to explore Downtown more! To help keep your resolution, we’ve put together a list of unique spots and activities that you can only find in Downtown. Here’s to a new year and new experiences in #DTJax! The 5 & Dime, A Theater Company | 112 Adams St.
Not many people know about The 5 & Dime. Nestled into the Urban Core, The 5 & Dime’s commitment to their community is reflected in their mission: telling stories that engage, inspire, entertain, and challenge audiences, nurturing a rich artistic culture in Downtown Jacksonville. Check out their 2019 lineup of shows that will entertain the entire family! Details. Want something to do every first Wednesday of the month? Well you’re in luck! 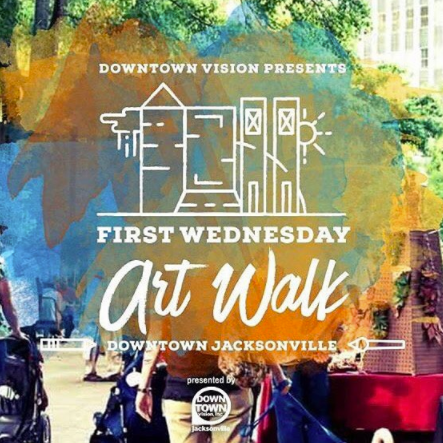 The First Wednesday Art Walk is a monthly event produced by Downtown Vision, Inc. (DVI) that brings people to the cultural and historical center of the city and showcase Jacksonville’s deep and energetic pool of creative talent. 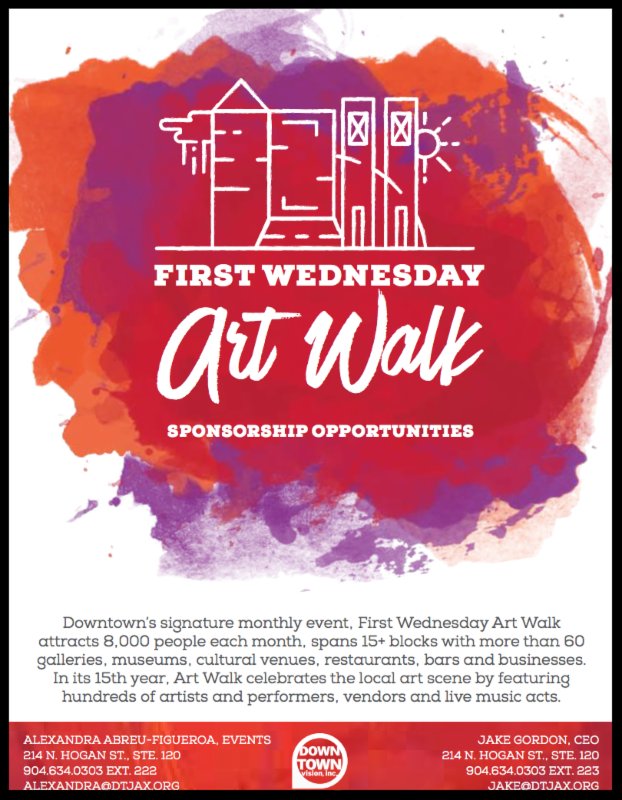 Open to visual and performing artists, Art Walk is on the first Wednesday of every month from 5 – 9 p.m., rain or shine. More than 35 Art Walk venues stretch across Downtown Jacksonville’s core and include Hemming Park, galleries, museums, cultural and educational venues, restaurants and bars, Downtown businesses and more! Details. Friday Musicale | 645 Oak St. The Friday Musicale is the oldest musical organization in Florida having been founded in 1890! Friday Musicale hosts outstanding concerts free of charge to the citizens of Jacksonville, provides educational outreach opportunities to local students, supports the next generation of musicians and music educators through college scholarship awards. When no events are scheduled, the auditorium is available for concerts, recitals, meetings, wedding receptions, parties and other private events on a rental basis. For more information on upcoming events, visit their website. Ritz Theatre and Museum | 29 N. Davis St. The Ritz Theatre is a historically African-American oriented theatre in the LaVilla neighborhood of Jacksonville, Florida. The theater, which seats 426, is used for a variety of music, dance and theatrical productions, as well as movies. Make sure to take a tour or catch a show at this iconic spot in #DTJax! Details. If you are looking to have a free activity that involves being active and exploring Jacksonville’s mass collection of art, then start touring Jacksonville’s downtown wall murals! All of these unique murals are within walking distance of each other, making it accessible for everyone. Most of these murals were created by ArtRepublic and range from all different styles of art, making it perfect for anyone to enjoy. Need some exercise and want to appreciate art at the same time? Here lies your answer! Details. Arepa Please | 474 Riverside Ave. Located in #DTJax’s Brooklyn area, Arepa Please is more than a restaurant; it’s a place that combines different cultures with a South American touch. Every dish is a result of hard work, passion, and the desire to deliver the best of South American flavors through signature dishes like the Arepa. Don’t like Arepas? No problem! You can also enjoy some of the best coffee in town powered by Bold Bean Coffee Roaster! Details. There has never been a kosher butcher in #DTJax, until now. Gili’s Kitchen offers fresh premium cuts of meat and fresh foods, makes homemade breads, including; challah, babbka, and sweet desserts. Want it catered? Whether big or small Gili’s Kitchen caters to all! You can now order online by visiting their website. MLG at Sweet Pete’s | 400 N. Hogan St.
Make your Sweet Pete’s experience even better by visiting their new in-house restaurant MLG. MLG is located directly inside of Sweet Pete’s making it a perfect stop before you shop! You can share small plates, sample fresh salads and creative sandwiches, savor local produce, seafood and meats; you name it! Enjoy cocktails and bites during your next visit to MLG! Details. Located on the corner of E. Independent Dr. and S Laura St; Tossgreen is a fast-casual restaurant with an environmental friendly emphasis and healthy, natural foods. If there is one aspect to our lives that never ceases to delight us, that’s the pleasure of eating. At Tossgreen, they make sure that pleasure never dulls down. Their fresh and scrumptious food ensures you eat good and live good especially, in this New Year! Details. Want something Healthy, Fast, and Delicious? Vale Food Co. is just that! This casual restaurant offers build your own bowls from Açaí Bowls to Avocado Toast & Poke Bowls from their Super Food Station. They have amazing amenities from selecting a meal plan (Maintain, or Weight Loss) or having these healthy foods hand delivered to you everyday (Sunday – Thursday). Start experiencing the lifestyle difference today! Details. Experience the city on a bike! One of the most popular activities in Downtown Jacksonville is biking along the St. Johns River. The Northbank and Southbank Riverwalks are the perfect cycling routes to enjoy both an urban scenery and the cool breeze from the river. The Northbank is a wonderful two-mile ride between the Jacksonville Landing and the Riverside Arts Market. You will even ride through the Love Locks Bridge-which not only connects the Urban Core with Riverside, but is also a known spot for couples to symbolize their unbreakable love. 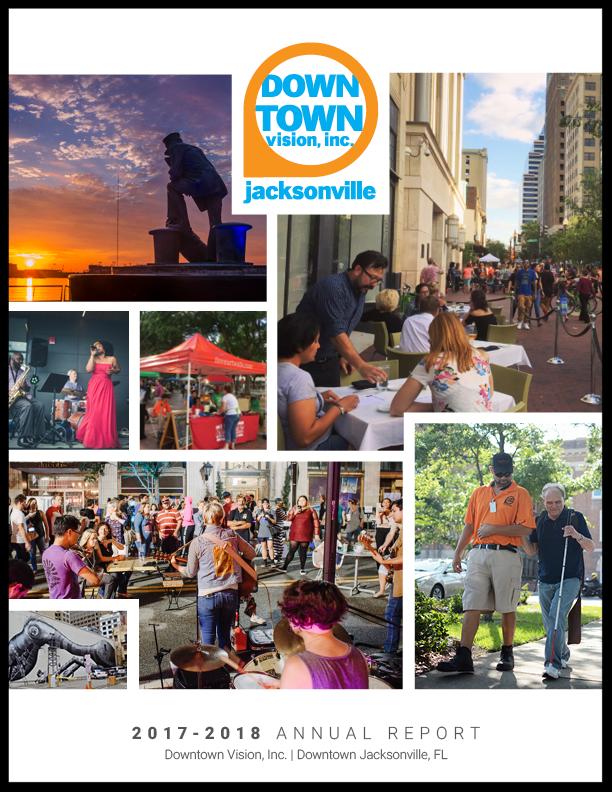 North Florida Bicycling Club also organizes routes that go all around Jacksonville, such as the Tour de Jax, which goes all through the heart of Downtown for those looking for a longer ride! For the water sports enthusiasts, urban kayaking is a great alternative to exploring the city. It is a unique way to experience both the urban scenery and one of Jacksonville’s natural beauties. The Jacksonville Kayak Company offers guided tours in Downtown Jacksonville, taking off from the River City Brewing Company Marina. Even some of the locals do not know about this popular downtown transportation! Park your car and cruise along the river. The St. Johns River Taxi has six pick up-drop off docks in Downtown Jacksonville-including the Jacksonville Landing, Friendship Fountain, Riverside Arts Market, and the Metropolitan Marian. So whether you are staying at the Doubletree on the Southbank or heading to the Jaguars game at the TIAA Bank Field, it is the ideal transportation to get around the urban core. Aside from providing a transit alternative, the St. Johns River Taxi also offers River Jam Sunset Cruises and Partners with the Museum of Science and History for River Quest Boat Tours every Saturday. Check out their website for more information! Looking to de-stress? In the past couple of years, yoga has played a major role in stress management. Stress and anxiety is alive even in Jacksonville where “It’s Easier Here”; which is why free yoga sessions are offered throughout the week. Unity Plaza in Brooklyn, dubbed as Jacksonville’s “central park”, along with the Winston Family YMCA that offers Tuesday and Thursday yoga sessions yearlong. With the built in waterfront and tiered seating, the Unity Plaza is the ideal central spot for sunset yoga. Now for the early birds looking for a healthy morning start, go further into Riverside and find yourself in Corkscrew Park. However, little known fact, before the hustle and bustle of the market traffic hits; Hot Spot Yoga’s Namie Rohack leads morning yoga from 9:00-10:00am every Saturday. Breezy Jazz Club | 119 W. Adams St.
Breezy Jazz Club is the premiere jazz club in #DTJax that features the best live jazz music, wine, and dining experience! The smooth sounds of jazz enhance the relaxing atmosphere at Breezy Jazz Club. The richness of the music flows softly inside and out onto the waiting sidewalk, making it a best place to be on a day off. Make sure to check out a show at this classic club! Details. De Real Ting Café | 128 W. Adams St.
Open for lunch during the week and dinner on Friday/Saturday nights, this cafe is as much a club as it is a restaurant; with live bands and DJ’s in residence several nights a week. This Caribbean Café serves all sorts of exciting meals such as jerk or curried chicken, conch fritters and curried goat and oxtail. Not busy on the weekend? Now you know where to go! Details. The Justice Pub | 315 E. Bay St. Check out this new law-themed bar and lounge in the heart of Downtown! The Justice Pub has events that range from stand-up comedy, live band performances and more! You can stay up to date with what’s happening with the Justice Pub here. THE MANHATTAN | 345 E. Bay St.
Want to visit a truly unique sports bar Downtown? The Manhattan Sports Bar & Lounge is an upscale locale that features a speakeasy-like atmosphere. At this classy bar and lounge, they feature modern photography and other elements that give a distinct, New York feel, including the outdoor patio and beer garden. Put on your most dapper attire and enjoy a night out in #DTJax with delicious food, upscale craft cocktails, and the best in sports entertainment. Details. The Volstead has been designed to embody an authentic 1920s speakeasy bar that serves premium bourbons, scotches and whiskeys in this 1920s-themed setting. Their talented bartenders create tantalizing hand crafted cocktails that will leave you wanting more. They also hosts events like Swing Dance Sundays and Saved by the 90’s Karaoke! Details. This New Year is filled with endless possibilities. These are just a few ways to see the variety that Downtown Jacksonville has to offer when it comes to arts, dining, fitness and nightlife. Whether you’re looking for a spontaneous date night or a way to explore a healthy lifestyle, this list will help you see the newest additions to #DTJax.